Coleophora hornigi Toll, 1952. Bull. Soc. ent. Mulhouse: 18, fig'd. Coleophora albicornuella Bradley, 1956. Ent. Gaz. 7: 148, fig'd. Leaf-miner and case-bearer: The larva feeds on a wide range of trees, shrubs and herbs, favouring Rosaceae, but not exclusively. 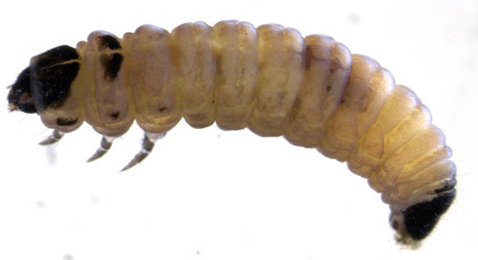 The fully developed cased larva may be found active in October and again, after winter diapause, in April. Cases, about 6 mm, of diapausing larvae may be found through winter, fixed to a tree or fence post. The dorsal surface of the case is usually covered in leaf fragments, but they can sometimes be worn off almost smooth. The ventral surface is swollen at the middle and has a keel, which usually bends upwards at the posterior. The cases of C. ahenella (on Rhamnus, Frangula, Viburnum and Cornus) and C. potentillae (case less swollen, keel not bent up, resting position less prone) are very similar (UKMoths). Brownish lobe case that lies almost flat on the leaf, either on the upper or on the lower side. Case widest about the middle. Ventrally there is a distinct keel. Mouth angle 0°. Full depth mines rather large. The flaps of cuticular tissue that serve to enlarge the case are cut out of the upper epidermis. (contrary to C. ahenella and C. potentillae, that use tissue from the lower epidermis). The removal of these tissue flaps creates holes that are much larger than those that serve as the entrance to the mine (Bladmineerders van Europa). The larva is illustrated in Bladmineerders van Europa. Adult: The adult is illustrated in UKMoths by Martin Kennard. The species is included in mothdissection.co.uk. Time of year - larvae: July to April (British leafminers). Time of year - adults: The moth flies in evenings and at night in late May and June (UKMoths). Distribution in Great Britain and Ireland: A wide variety of habitats throughout Britain (UKMoths) including Bedfordshire, Buckinghamshire, Caernarvonshire, Cambridgeshire, Cheshire, Dunbartonshire , Durham, Fife, Glamorgan, Haddington, Herefordshire, Hertfordshire, Huntingdonshire, Isle of Wight, Merionethshire, Mid-west Yorkshire, North Essex, North Hampshire, Stirlingshire, West Gloucestershire, West Norfolk, West Suffolk and Worcestershire (NBN Atlas). During the day it may be found resting on vegetation (UKMoths). Distribution elsewhere: Widespread in continental Europe including Austria, Belgium, Czech Republic, Danish mainland, Estonia, Finland, French mainland, Germany, Greek mainland, Hungary, Italian mainland, Latvia, Lithuania, Norwegian mainland, Poland, Russia - South, Slovakia, Slovenia, Sweden, Switzerland and The Netherlands. Also recorded in Near East and North Africa (Karsholt and van Nieukerken in Fauna Europaea).